Home » College Students » Job Search Advice » Who Actually Reads Your Resume? Who Actually Reads Your Resume? Many of us know the pain of sending off your resume to some company only to receive no response. We sit, refreshing our emails and pondering if our resumes were even read, let alone even received by an actual employee at that company. We’re going to let you in on some little secrets to help you finally get some closure. A little heads up, many times the answer to “who reads your resume?” is actually no one. Large companies may get hundreds of resumes a day for only a handful of openings, with many recruiters reporting that close to 50% of those applicants simply don’t possess the basic qualifications for that job. To put this into perspective, Goldman Sachs received over 17,000 applicants for a summer internship in 2013, for only 350 open positions. Asking someone to sift through those large piles is quite costly and ultimately unfeasible. Therefore at most places, before your resume even gets in the hands of an actual person, it’s put through an Applicant Tracking System (ATS) that pre-screens resumes and filters them based on whether or not contain certain keywords or phrases. So, what exactly is an ATS and how does it work? There are a number of different applicant tracking systems, but their basic functions are typically the same. ATSs use a similar process to that of SEO, or search engine optimization. Search engine optimization is a strategy many companies utilize in order to anticipate the certain keywords that someone might use in a search engine. The companies then mimic those same keywords in their content to ensure that when someone searches for something, the company’s website will be higher up in the search results. ATSs work in a similar fashion. Certain companies will identify specific keywords that are integral to their job posting, and it’s your job to anticipate those keywords and include them so that your resume will appear higher on their list. For example, if you’re looking for a job as a sales manager, you might want to be sure that you have the words “sales” and “manage” somewhere in your resume. Your best bet is to integrate frequently used words from a job posting into your resume to ensure that you’re presenting a resume that shows you’re qualified for a position. But remember, even if you do happen to be one of the lucky few who gets their resume forwarded to an actual person, studies have shown that the average recruiter spends only about 6 seconds on your resume. Fortunately, there are tools to ensure your resume is as strong as it possibly can be and will fall into the hands of the right people. 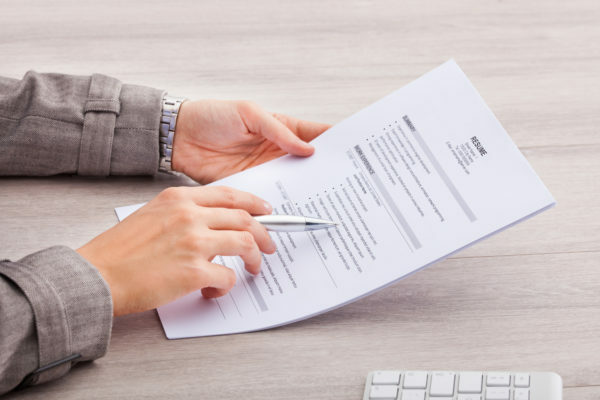 If you’re still working on creating that perfect resume, head over here to check out what our experts say should be included in a resume, and how to format it. Once you’ve completed your first draft, check out VMock to refine and perfect it. VMock is a platform that analyzes your resume and assigns it a score based on how it stacks up against others based on strength, format, and competency. It will then give you actionable feedback on how to make sure it’ll pass the rigorous ATS screening systems.